Rapid Spray’s pressure washing trailers are made to stand the test of time and perform under the most extreme environmental conditions. Featuring quality components, a sturdy frame and robust wheels and tyres, our trailers are durable, reliable and guaranteed to help you get the job done with no fuss. Drawing on our years of expertise, our pressure washing trailers are designed in a way that makes light work of any pressure cleaning task. They’re also built with safety in mind and more than 18 options are available, including a safety chain, LED lights, reflectors and high-performance hydraulic brakes. 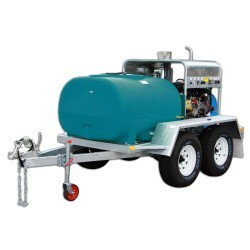 With a strong, hot dip galvanised steel frame and a tank made from the toughest polyethylene, our mobile pressure spraying solutions promise years of reliable service. They’re resistant to the knocks and bumps of transit and are able to handle a wide range of chemicals as well as water. Their 50mm tow hitch and quality 7pin trailer plug, make our pressure washing trailers a breeze to attach to your vehicle. They also feature chequer-plate mudguards and mud flaps, as well as sturdy, 15-inch rims and tyres. With a range of attachable extras – including optional diesel motors, detergent tanks and extra hose reels – it’s easy to see why our pressure washing trailers are so popular: they’re a cinch to customise and operate. Simply add whatever you need to create a set-up ideally suited to your specific situation and you’re ready to go. So no matter what kind of pressure cleaning job needs to be done around your home, farm or factory, contact Rapid Spray today and enquire about our fantastic pressure washing trailers. They’re simply guaranteed to deliver – every time.